PoP-Ed. posts may be written about anything related to the District and submitted via email to princeofpetworth(at)gmail please include PoP-Ed. in the subject line. The following was written by Paul Williams, President of Historic Congressional Cemetery, and Kelly Carnes, cemetery staffer and yoga instructor. Last weekend, Washingtonians missed out on one of the hottest yoga trends to date: goat yoga. 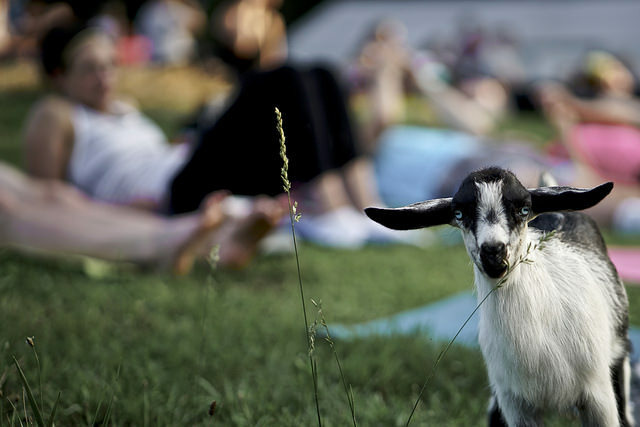 Historic Congressional Cemetery, which has hosted eco-goats twice and a weekly yoga program, was denied the opportunity to bring goat yoga to the District by the DC Department of Health. The event, previously schedule for July 22, would have featured three classes in which 10 baby goats joined the yogis on their mats to romp, play, crawl, and cuddle while the yogis practiced a gentle (mostly seated) sequence designed to educate them about the specific physiological traits that make goats unique like their incredible balance and fortified digestive system. Educational materials were integrated into the previous eco-goats visits too and each event brought hundreds of new visitors to the cemetery, raising awareness and funds to help preserve this iconic local landmark. The DC Department of Health’s reasoning? Director LaQuandra Nesbitt claims that the yogis and goats pose a danger to each other, even though this style of practice has been embraced all over the country, including Louisville, Kentucky where she was the leading public health expert before taking her post in DC. What does the goat’s farmer and caregiver, Mary Bowen, think of the excuse that yogis could potentially fall on and injure goats? In her own words the excuse is “ridiculous,” as is the notion that the cemetery would need to hire a wildlife expert to be on hand for any such event. News flash, DoH, goats are not wild animals! In fact the domestication of goats begins 10,000-11,000 years ago! Supposedly there is also a “no touching” policy barring any interaction with livestock lest it lead to zoonotic disease transmission, and yet, when it was brought to the Department of Health’s attention that the Mount Vernon BID is hosting their annual petting zoo in Mt. Vernon square on July 29, they knew nothing about it. I guess we should all go into quarantine-mode for the impending goat-flu that is about to bring Washington to a screeching halt. Despite Nesbitt’s empty claims that she wants to “keep communication lines open” she and her wasteful team of attorneys have not offered any realistic solutions that would allow the cemetery to proceed with it’s goat yoga event. Meanwhile, the baby goats are quickly growing to maturity and by summer’s end will be too big for yoga and hard at work eating their weight in weeds as natural lawnmowers. The actual solution? Let the cemetery host goat yoga, a completely harmless activity that will only bring education and joy to local yogis and spectators, exercise to energetic adorable baby goats, and attract new patrons and preservation funds to the nation’s oldest cemetery, a landmark that deserves our support, not our suffocating bureaucratic oppression. Sign this petition if you agree and want to see goat yoga in DC! SinSA I'm so sorry for the loss of your grandpa.